Toontrack hits the mark again with a distinctive sound and samples of extremely sought-after hardware. Wide variety of rare and unusual drums. All samples recorded with high production values. Incredible sound from legendary signal path. A couple of installation issues. 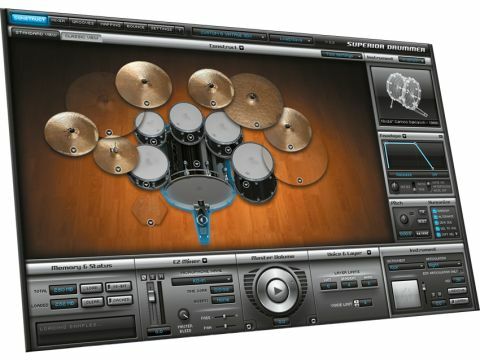 Hot on the heels of its well received Metal Foundry and Lost New York Studios releases, Toontrack offer a huge new Custom & Vintage expansion pack for its Superior Drummer 2.0 virtual instrument. The first few Superior SDX packs focused mainly on samples of classic drums and cymbals from well-known manufacturers, but the drum selection here is noticeably more esoteric, featuring a huge variety of rare and interesting drums to add to your Superior collection. Diving straight into Superior's kit construction window, a thorough investigation of the choices on offer reveals a huge arsenal of positively drool-worthy percussive instruments. Big names like Ludwig, Gretsch, Noble & Cooley and Slingerland are represented, along with high-end boutique manufacturers such as Camco, Craviotto, Noonan and Canopus. Cymbals are mainly K Zildjian, with a variety of Turkish-made crashes and rides on offer. Paiste provides a handful of further cymbal options, including 16-, 17- and 18-inch fast crashes plus bell, mellow and dark rides in various sizes. The final selection is the Steve Hubback Cymbal Sculpture, an unusual 24-inch handmade ride which offers a wide variety of unique tones. One of the most exciting features of the Custom & Vintage pack is the signal chain used in the recording process. All of the drums were recorded at London's 2KHz Studios and the list of equipment used in the sessions will make any gear nerd green with envy: an ex-Abbey Road EMI TG console with Germanium mic pres, a variety of classic Neumann, AKG and Sennheiser mics and the legendary Helios F760 compressor on one of the room mic channels. Soloing individual mic channels in Superior's mixer window reveals the outstanding clarity and character on offer. It's also worth mentioning that the pack includes library of MIDI patterns played by highly-experienced session drummer Chris Whitten. Depending on the style of music you're making, these may come in handy. Trying to add up the value of the sounds here is practically impossible. A drum like the Craviotto Timeless Timber snare alone would cost a couple of thousand pounds, putting the sounds in this expansion pack out of the reach of all but the most well-heeled drummers. For most of us, this is as close as we'll get to some of these rare and highly sought-after instruments. The sound of the samples in this pack is perhaps best described as being less American than previous releases, with a less polished sound which might work better for British music than some of the slick, super-clean kits already available. Overall, the Custom & Vintage SDX is highly flexible, providing the professional results we've come to expect from Superior Drummer. Our audio demos of the Custom & Vintage SDX feature a selection of drums including the 18x24" Camco Oaklawn kick (wood beater), 5.5x14" Craviotto Timeless Timber snare, 16x16" Gretsch round badge floor tom, 1970s 14" Zildjian New Beat hi-hats and K Zildjian cymbals. Basic drum track using default mixer settings. Example of same track but with simplified mixer setting using KD-In, SD-T and OH mics only. The result is a simpler mix which fits nicely into less polished productions. Example of the sounds which can be achieved by adding increasing amounts of heavily compressed room mic to the mixer setting from the previous clip. The compressed room mic fades in over the course of the first 15 or so seconds, then is left at this level for the remainder of the demo.